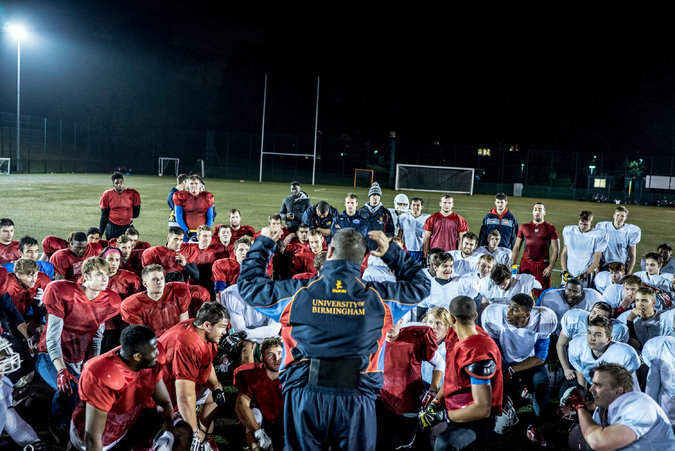 The University of Birmingham Lions, coached by Wayne Hill, at practice last week. BIRMINGHAM, England — After two hours talking X’s and O’s in the classroom and another hour of walking his players through those plays in a gymnasium, Wayne Hill gathered his defensive squad at center court. “Let’s go out this week and get excited about playing football,” Hill said one night last week. “And if you score, I’m going to throw some shapes with you in the end zone,” he added, using the local idiom for dancing. After some laughter, the players raised their hands together, screamed “One-two-three defense!” and left the gym with their friends. This was no American high school or college, but the University of Birmingham Lions, one of the best collegiate teams in the country.